Do you… Follow the Flag? 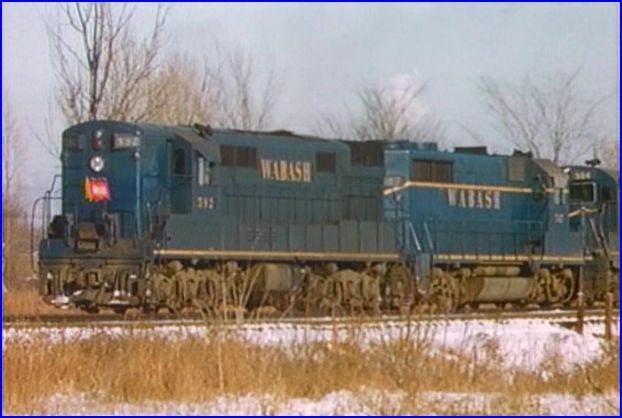 The Wabash was the original Fallen Flag, when it was merged into Norfolk and Western Railway. A colorful railroad was lost on that day. It lives on in this train video from Green Frog. Lucky for us, Emery Gulash was out there, with his high quality 16mm color film. 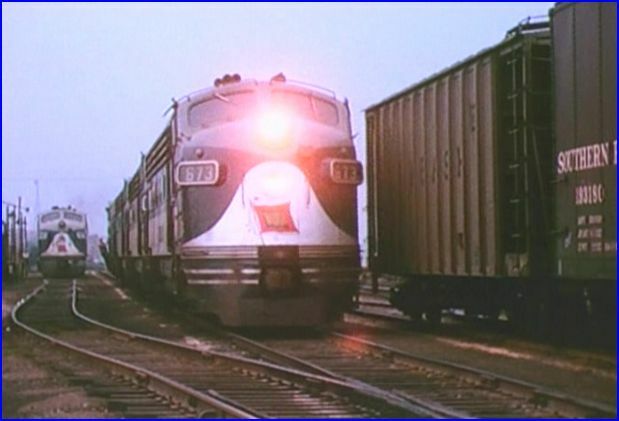 So, you have some old vhs tapes with some favorite train videos. The ones that are working, still play good, at least for now. Is it worth upgrading to the same show, in a DVD format? Advantages to DVD procurement. Better picture quality. Improved sound. Smaller storage profile. Green Frog has a chapter search function on this DVD. Although you don’t get a full chapter menu, you can jump around the program easier. This show is divided into six chapters. Modelers get to pause the image, which remains clear. A huge advantage for weathering details. Car data can be easily discerned. Details are rendered in a finer quality. Check the paint on the locomotives, and the weathering… see how it pops out better? You can even haul the laptop into a train room, or bring it to a meeting, with the ability to play the DVD. Snow scenes are one of the best examples of improved clarity. The snow powder flies up, when a train passes. The old tape has the snow also, but that fine detail is lost. The trains have better definition when; viewed on the car float , the high trestle, or across a field. Distant views get lost on vhs format. Detroit viewed from across the river looks clearer. 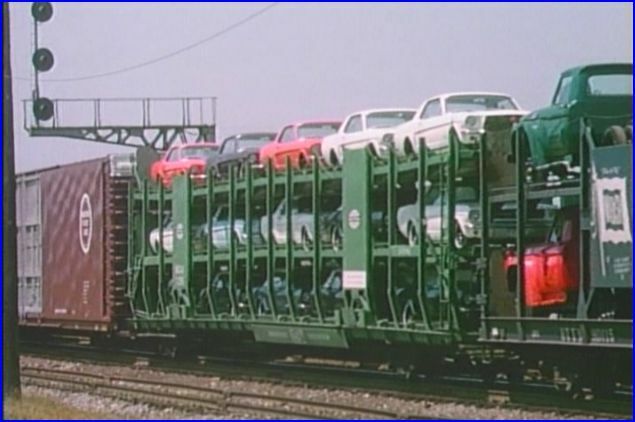 The trains have better definition when viewed on the car float , the high trestle, or across a field. The slight EMD smoke is easier to catch too. Check the white flags on the F7 units and the Alco FA’s. See the shiny paint reflecting the sunlight, on the new 86′ high cube boxcars. Tell all, or parts of the above validation, to your significant other, on an as needed basis. Season to taste. Upgrade this to DVD. Just don’t blame me! Wabash is one of my all time favorite Green Frog programs! They get everything right on this show. Absolutely loaded with freight trains. It doesn’t suffer from being overwhelmed by too many , all the same looking, passenger trains. There are many great views of… the passing train. Freights rule, after the first portion of the program which has the obligatory Wabash Cannonball. The F7 locomotives dominate the trains. Bluebird paint scheme is the common one here. Solid blue sightings grow, as the timeline progresses. Fairbanks Morse Trainmaster checks in, as the rare locomotive. GP7 units are seen. GE U25B class, with the picture window. A nice set of Canadian National F7′s in green/ gold look great. DT&I is another connecting road, that is shown. Ann Arbor GP35 units appear, in DT&I inspired paint. 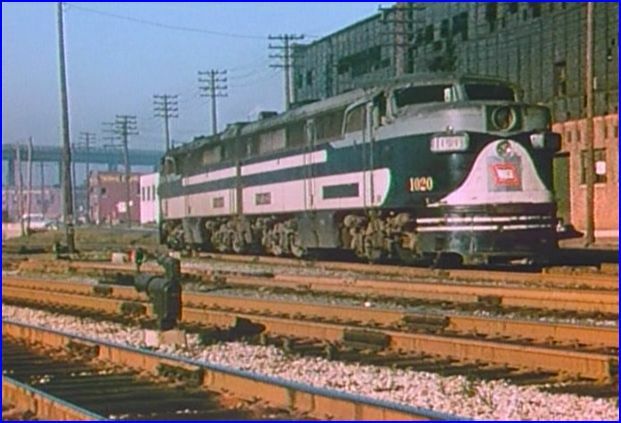 Near the end of the program, and the end of the Wabash, Norfolk & Western appears, in ever increasing numbers. 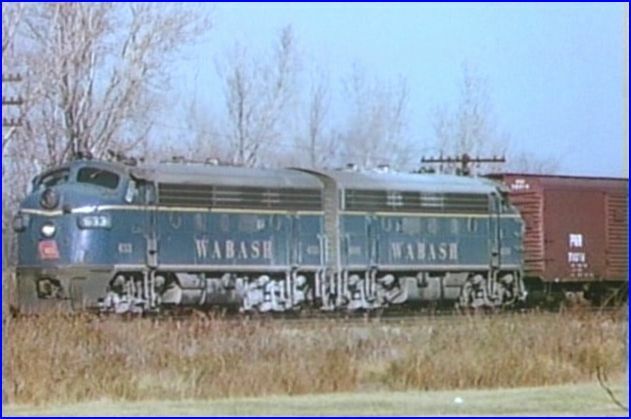 The Wabash caboose fleet has some tri color repaints that are classic. N&W cabooses trail the trains later in the show. The ‘ Follow the Flag’ logo, is omnipresent on the freight cars. 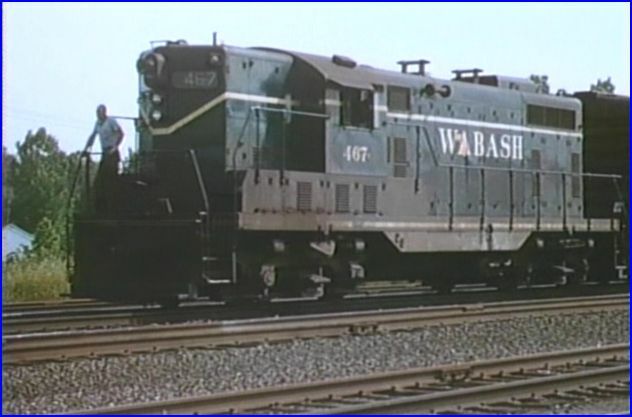 Memorable moment: At Milan, a Wabash GP7 with quite a bit weathering, switches simultaneously, alongside a pair of new, Ann Arbor GP35’s. Model that scene! Check those Ford Mustangs on the auto rack! Catch the announcer: At Delray Jct. 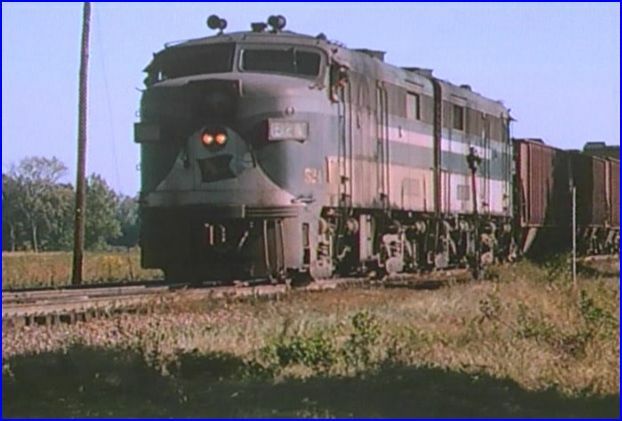 It’s NOT a Chicago & Western Illinois RS-1 roadswitcher. It IS a Chicago & Western Indiana one. Stump your friends. Who owned Dearborn Station in Chicago? Yes, the CWI. These F7 units with the final train from Oakwood Yard, before merger into NW. 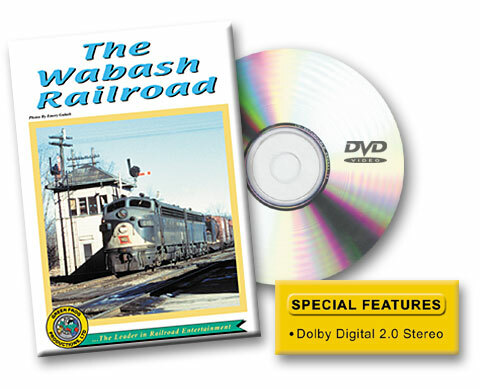 The Wabash Railroad is all the more enjoyable on the DVD. I just love to watch this show and…… Follow The Flag ! This entry was posted in ATVR Reviews, Green Frog Prod. 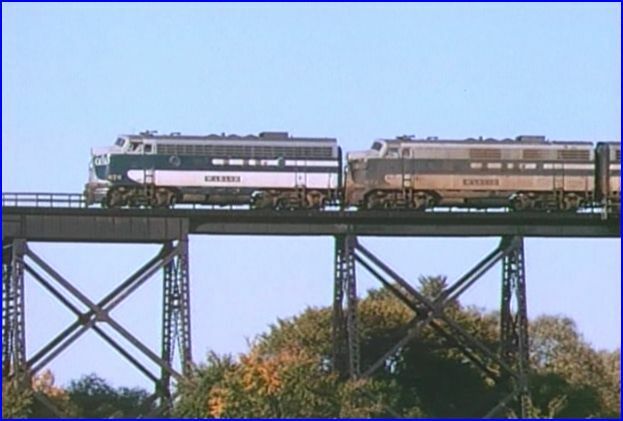 and tagged American Train Video Reviews, Canada, Emery Gulash, Norfolk & Western, Railroad, Train DVD by William J. Hudson. Bookmark the permalink.